AMSOIL Air Filters represent a major breakthrough in filtration technology. The revolutionary nanofiber technology used in AMSOIL Ea Filters captures more dirt, holds more dirt and allows better air flow than conventional air filters. AMSOIL Ea Filters improve engine performance and help engines last longer. AMSOIL Ea Air Filters allow more airflow than filters that use cellulose media alone. Cellulose fibers are larger than nanofibers, and have larger spaces between the fibers, causing contaminants to load in the depth of the media and plug the airflow path, which results in higher restriction and less capacity. The synthetic nanofibers in EaA Filter media have submicron diameters and small interfiber spaces, which result in more contaminants being captured on the surface of the media and lower restriction. AMSOIL Ea Air Filters hold up to two and a half times more contaminants than cellulose air filters. Since the nanofibers in the media are so small there are more pores per square inch, allowing for higher dirt-holding capacity and lower pressure drop when compared to cellulose filter media alone. Thinner media fibers produce more uniform pore size distribution, improving the filter’s overall quality and ability to capture and retain particles. Testing shows that Ea Air Filters hold 15 times more contaminants than a wet gauze type filter. When cleaned according to AMSOIL specifications and used in normal service, AMSOIL Ea Air Filters are guaranteed for 100,000 miles or four years, whichever comes first. EaA Filters remain effective for 25,000 miles or one year before requiring cleaning. This coincides with the AMSOIL 25,000-mile/one-year motor oil drain interval, adding even more convenience for motorists by consolidating routine maintenance. 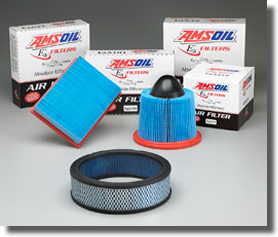 AMSOIL Ea Air Filters provide superior air filtration for vehicles in the auto/light truck market. EaA filters should be cleaned every year or 25,000 miles, whichever comes first. Carefully remove the filter from the housing. Clean the housing with a shop towel, being careful not to knock contaminants into the air inlet. Filters can be cleaned by carefully vacuuming the filter media on the dirty side, or by holding the filter with one hand and carefully blowing the filter media at a 45 degree angle on the clean side using low-pressure shop air (15-20 lbs. psi). AMSOIL Ea Air Filters are guaranteed for four years or 100,000 miles, whichever comes first. 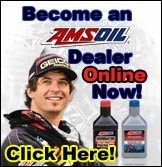 The guarantee applies only if the filter has been serviced according to AMSOIL recommendations. In off-road, frequently dusty or other severe duty applications, clean and change more often as determined by operating conditions or as indicated by restriction gauge.